Experience Advent in a way that helps us discover how we can invite God’s love into our lives, our homes, and the world today. Advent is a time for awaiting the arrival of God’s ultimate Guest but there are “guests’ already among us. What better way than by participating in the Annual Advent Wreath Workshop and Dinner and begin to prepare your heart and mind for the coming of Jesus. The entire congregation is invited to participate in this event on November 27 from 5:30 – 7 p.m. in McWhirter Hall. 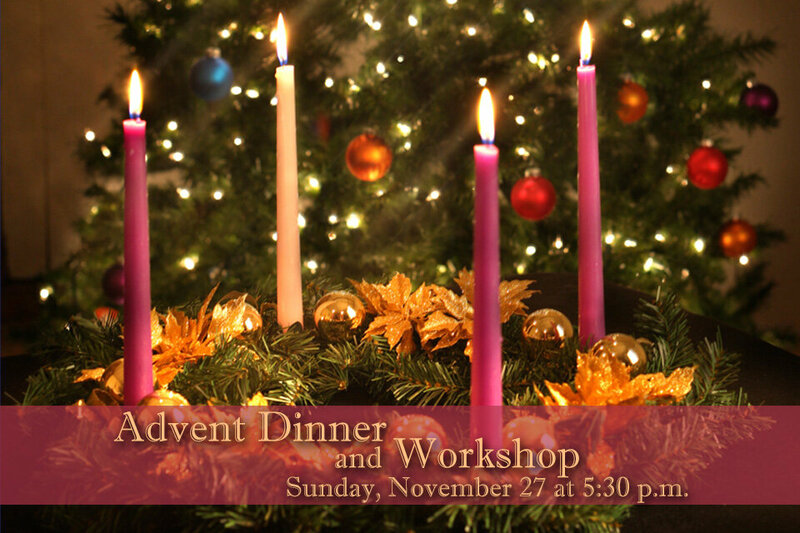 We begin with a potluck dinner, followed by hymns, readings, and preparation of Advent wreaths. The dinner will be potluck, so everyone is encouraged to bring a side dish, a salad, or dessert to share. Please make your side dish large enough to feed your family and a few more people. For dinner: last name A-F bring a starchy side dish or bread; G-R vegetarian entrée, vegetable side, or salad; S-Z dessert. Meat and drinks will be provided. A variety of families can create an Advent wreath to use in the home. Wreath making supplies will be provided, but each family is encouraged to bring greenery for decorating the wreaths. If you still have a Styrofoam wreath form from past years, please bring it and re-decorate it with fresh greenery and new candles. This will allow us to have enough supplies for everyone who wants to create a wreath. The wreath-making and dinner will conclude in an Advent worship time, celebrating the First Sunday of Advent! Resources and devotional materials will be available for church families to help experience and prepare for the gift of Christmas – our Guest is on the way!